The first two works are optimistic, communicative, mischievous little jewels, and are scarcely known. This is not true of the Appassionata, which Beethoven regarded as his greatest piano work up until the Hammerklavier Sonata. Musical accompaniment to Ulla von Gemmingen’s vernissage in the “Galerie am schwarzen meer”. Titel of the vernissage: “Topography of the Instant in time. Lithography and Co.” Exhibited works created between 2009 and 2011. Michael Leslie takes his listeners on a brief journey through the classical and romantic eras, thereby demonstrating the incredible variety, workmanship and range of sonorities characteristic of pianos from the late 19th and early 20th centuries. At the 6Th international lithographic symposium in Tidaholm, Schweden which takes place every four years, Michael Leslie performed the Schubert Sonata B Flat Major D960. A comparison of these two C Minor sonatas - an early and a late work - give an idea of the enormous distance Beethoven traveled – both musically and intellectually – in the course of twenty-five years. The outer movements of opus 10/1 with their terse and disruptive energy show Beethoven in that combative frame of mind familiar through several works in C Minor – the Pathétique Sonata opus 13, the C minor Violin Sonata opus 30/2 and the 5th Symphony opus 67. The hymnic beauty of the slow movement brings relief but not resolution of conflict. The opus 111, however, the final, crowning keystone of the edifice of the thirty-two piano sonatas, reaches out in the slow movement to an ineffable synthesis of opposites, the work speaks of struggle and reconciliation, or in the words of Hans von Bülow, of Samsara and Nirvana. The bass-baritone Michael Schopper and the Australian pianist Michael Leslie took up the challenge of this grandiose and far reaching collection of Schubert songs for the 2nd Guttenberg Castle Concert. Michael Leslie’s playing, which is subtle and full of nuances (a difficult feat to pull off on the 1855 Schiedmeyer piano at Guttenberg) provided a perfect foil to the rich and powerful baritone of Michael Schopper. At this conference the complete range of fundamental philosophical themes raised by Darwin’s theory of evolution was discussed. This included the philosophical potential of Darwinism, the limits of biology, the effects of Darwin’s work on ethics and epistemology, and the philosophical legacy of Darwin’s thought, theory of evolution and religion. Under the heading: “DNA and the Evolution” of Motifs in Beethoven’s greatest piano work ‘The Hammerklavier Sonata’ was given by the Australian pianist Michael Leslie. Some writers believe Haydn’s late C Major Sonata Hob. Verz. XVI 50 to be his greatest and most original piano work. The early Beethoven sonata opus 10/1 and the sublime final sonata opus 111 have more in common than the tonality of c Minor. The Chopin Polonaise-Fantasy opus 61 shows the composer on the brink of a new tonal language and a freer, more flexible form of composition. A radiant minature of sparkling wit and brevity – the Haydn D Major Sonata. Serenity and reconciliation in the face of death – the great Schubert B Flat Major Sonata. A pilgrimage, a multifacetted compendium of life’s experiences – the Beethoven Diabelli Variations. 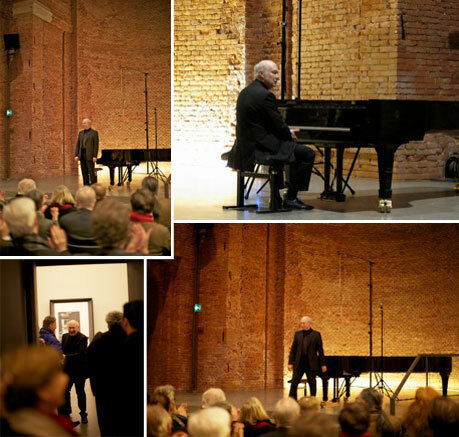 …this was one of the finest piano concerts I can remember. Thank you so much for this musical feast! I hope that you are enjoying bathing in this good feeling of completion after many months of preparation, in fact a life time of dedication to the piano and music. was inspired by and named after the highly successful Eleven-eleven matinee concerts held in London and Tel Aviv during the nineteen seventies, the brain child of the world-famous conductor and composer Leonard Bernstein. The artistic director of the Olching concert series, Michael Schopper, himself took part himself in several of Leonard Bernstein’s matinees in Tel Aviv, and hereby perpetuates the tradition. Michael Leslie appears regularly in these matinees.